We are utterly proud, excited to be part of this epic, epic poetry festival in Birmingham, part of a weekend-long series of astonishing events. Jess May Davies - Jess is an artist from Redditch, and now a part of Birmingham’s poetry community. Jess is the founder of Stirchley Speaks – a monthly spoken word night in Stirchley, a writer and a workshop facilitator. As a self confessed introvert, Jess uses poetry to explore their own identity in relation to mental health, environment and their sexuality. Casey Bailey - Casey is a poet, spoken word performer, author, facilitator, rapper and secondary school senior leader, born and raised in Nechells, Birmingham. His debut short collection was released by Big White Shed and his debut full collection by Verve Poetry Press. Aliyah Hasinah - Aliyah is a freelance activist and poet whose writing focusses on personal understandings of history, politics and social commentary. Her work has been commissioned by The National Trust, BRAP, Co-Ed Foundation and Channel 4 Random Acts. Sean Colletti - Sean is a native of Southern California but has lived in the UK since 2009. He recently published his first pamphlet of poetry, Saeculum (Bare Fiction, 2018). He has hosted and performed at various poetry and spoken word nights nationally and internationally, including winning both individual and team slams, and enjoys collaborating with other poets and artists. Yasmina Silva - Yasmina is a student, poet and activist whose academic and artistic work centers around intersectionality, deconstructing the world, and empowering marginalized identities. She also looks to celebrate to beauty of womanhood, blackness and the diversity of cultures in the world. Having had the privilege to live in several African countries, she is an advocate of African unity and progression with ambitions of promoting social development through the arts. Dennis Muhirwa - Dennis was born in Uganda, moved to Birmingham for University. He is a final year Mechanical Engineering student at University of Birmingham who spends a lot of time using art and creative writing to express himself. Scarlett Ward is a 25 year old Wiccan poet and snail enthusiast working from Cannock Chase forest in England, UK. Her poetry has recently featured in anthologies from Verve Poetry Press, Hedgehog Poetry, Fly On The Wall Press and Nothing Books. She has worked with Arches Gallery to run Pen To Paper writing workshop as guest leader and her monthly poetry spoken word evening ran from her family café “Del Nino’ was nominated for a Saboteur Award for best poetry event in the UK in 2018. Leon Priestnall - Leon is a Poet based in Birmingham. He has performed his poems up and down the country, headlining at The Door in the Birmingham Rep and performing spontaneous verse on BBC Radio. He is also host and founder of Birmingham spoken word night Howl. Address: 45 Station, Street, Birmingham, UK. We are utterly proud, excited and pleased to share with you, the Inaugural Melbourne RAP Party! Candy Bowers is a writer, actor, producer, theatremaker and filmmaker. The artistic director of Black Honey Company, Candy has pioneered a fierce sub-genre of contemporary performance that delves into the heart of radical feminist dreaming and earned her the 2018 Geoffrey Milne- Green Room Award for outstanding contribution to Independent Theatre. Her original work for stage includes Hot Brown Honey, Who's That Chik?, Australian Booty, MC Platypus & Queen Koala and One The Bear- A Fairytale for the Hip Hop Generation. She has written poetry, short stories, essays and commentary for The Lifted Brow, SBS Life, Junkee and PerilMag. She is published in Yours Truly- Women of Letters (Penguin), She's Having A Laugh (Affirm), Queerstories and Growing up African in Australia (Hachette). She is a Wheeler Centre Hot Desk Fellow, recipient of the Australians In Film LA Mentorship Program and is currently working on her first feature film with Robert Connolly's Arena Media. Emilie Zoey Baker is an award-winning poet and spoken-word performer who has toured internationally including being a guest at Ubud Writers Festival, The Milosz Festival Poland and was the winner of the 2010 Berlin International Literature Festival’s poetry slam. She teaches poetry to both kids and adults and in 2014 was core faculty for the spoken word program at Canada's Banff Centre. Nour Abouzeid is a Melbourne-based poet and spoken-word artist. A regular on the Melbourne poetry slam scene, he was the Victorian state champion in the 2010 Australian Poetry Slam and has continued to perform and run workshops in Australia and abroad. Nour is also part of the Melbourne Slam Team this year representing Australia at the National Poetry Slam in Chicago. Nel Mama Boho performer/producer, spoken word artist & running bitxh has been cervically speaking for twenty years. Cutting her teeth on ABC TV, she's worked at the BBC, Chn 10, 9, 7 and on stages nationally and internationally. A fiercely proud queer, feminist woman-of-colour, Nel Mama Boho is a passionate advocate for social change through the arts. N'fa Jones (lead vocals/song writer) is a multi-cultural Australian/Sierra-leonean artist credited for establishing the Australian Hip Hop movement with his band 1200 Techniques in 2000. Since then N'fa has toured and lived abroad, nurturing youth groups and community events, school workshops and children with specific social difficulties. He found his passion as a solo artist while living in London, moved back to Australia and released 2 critically acclaimed albums. N'fa stimulates local musical communities, co-creating and delivering a Diploma of Music focused on Hip Hop, at Box Hill Institute, crafting the landscape of Australian music. Laniyuk was born of a French mother and a Larrakia, Kungarrakan and Gurindji father. Her poetry and short memoir often reflects the intersectionality of her cross cultural and queer identity. She was fortunate enough to contribute to the book Colouring the Rainbow: Blak Queer and Trans Perspectives as well as winning the Indigenous residency for Canberra's Noted Writers Festival 2017. Laniyuk received Overland’s Writers Residency for 2018 as well as being shortlisted for Overland’s 2018 Nakata-Brophy poetry prize. Wāni is a proud descendant of the Bashi peoples of Walungu, as well as the current Incarnation of the Afronaut. He spends his times teleporting through Universes and time-scapes navigating between dreams of becoming the fire-fist pirate king Hokage master of all four elements, and unfolding tales from a generation who quite honestly might be too good for this Universe. Kirsty Marillier is a South African actor and writer based in Melbourne / Naarm. Being a mixed race woman of colour raised in SA, Kirsty identifies as coloured, she uses her writing to reclaim her identity and deconstruct the relationship poc have between migration and disempowerment. Melbourne-based DJ, event curator and radio presenter, MzRizk, is renowned for her ongoing contributions to Melbourne’s rich cultural and music landscape. Her many projects are a distinct blend of music knowledge, creative diversity and cultural and community engagement. As one of Melbourne’s busiest DJs, MzRizk has supported Yasiin Bey/Mos Def, Public Enemy, Common, Talib Kweli, Jill Scott, Snarky Puppy, Badbadnotgood, The Daptones, John Morales, The Internet, Bilal, Cody Chestnut, Maseo (De La Soul), Jurassic 5, Maxwell, Tank & The Bangas, Alsarah & The Nubatones and many more. She currently hosts weekly show Boogie Beat Suite on PBS FM. Sean M Whelan is a poet, performer, marriage celebrant, DJ and podcaster. He collaborates extensively with musicians, including The Interim Lovers and Isnod. Most recently he has begun a creative writing themed podcast called More Than A Whelan in which he writes and performs material based on creative prompts supplied by listeners. Harvey Zielinski is a queer transgender actor. Since graduating drama school in 2017 he has been the Red Stitch Actors' Theatre Graduate Ensemble Member, and performed there in Taylor Mac's Hir, Annie Baker's The Antipodes, and Tennessee Williams' Suddenly Last Summer. In 2018 he was also a top ten finalist for the Heath Ledger Scholarship, awarded an Ian Potter Foundation grant to study at the HB Studio NYC, and the recipient of a Casting Guild of Australia Rising Star Award. Dj Selecta Suz da Fuse… she plays roots music: reggae, blues, funk, soul, latin, dancehall and more! da Fuse has held residencies at Ruby Tuesday and Nieuw Amsterdam; appeared at Bellville, 56 Bricks, White Hart and Section 8; and has played support for, RUCL, Lotek, The Liberators, Frente Cumbiero, Sinks, Diafrix, Remi and GL. Address: 7-11 Dawson Street, Brunswick Vic, Australia. Feira Preta Festival R.A.P Party. 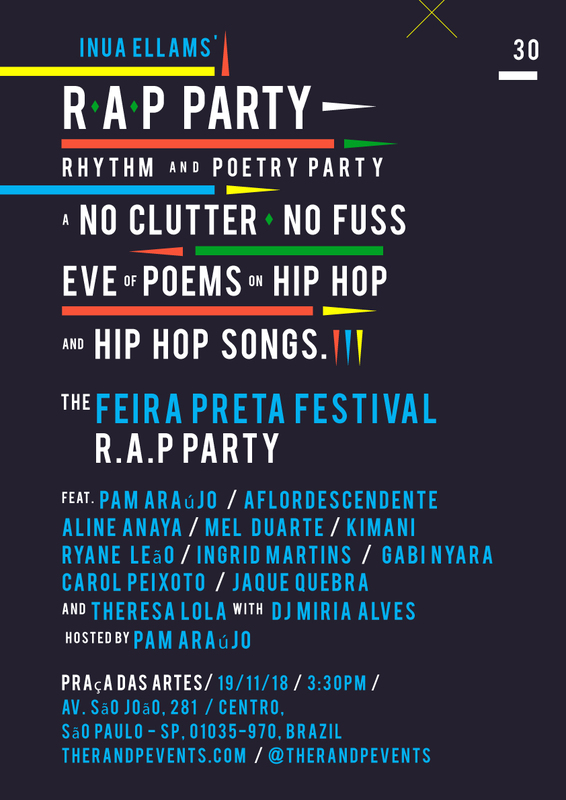 In this R.A.P Party – Rhythm And Poetry Party – a nostalgic, no-clutter, no fuss, straight up evening of hip hop inspired poems and hip hop songs, 10 poets will gather to celebrate the art form and the culture in the context of the Feira Preta Festival. 2018 marks 130 years since the abolition of slavery in Brazil, as well as 30 years of the Black Women ́s Movement. The poets will be sharing poems reflecting these powerful themes in Brazil’s history. Pam Araújo, Aflordescendente, Aline Anaya, Mel Duarte, Kimani, Ryane Leão, Ingrid Martins, Gabi Nyara, Carol Peixoto, Jaque Quebra, and Theresa Lola. 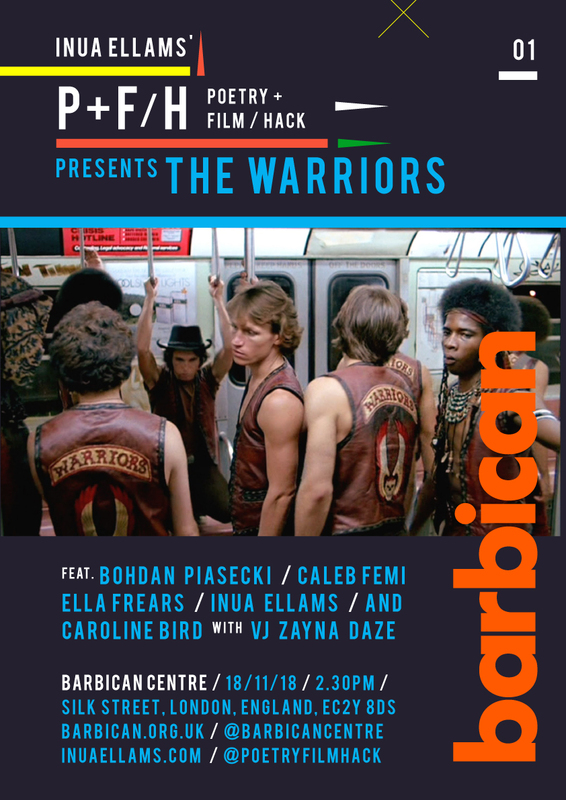 Straight after a screening of Walter Hill's stylised classic action film The Warriors, poets deliver lyrical meditations created in response to its themes of tribes and territory, poverty and struggle. Caleb Femi was the first Young People's Laureate for London. He is also a director, photographer and English Literature teacher. Caleb is featured in the Dazed 100 list of the next generation shaping youth culture. He has written and directed short films commissioned by the BBC and Channel 4 and poems by the Tate Mordern, The Royal Society for Literature, and more. Caleb has also won the Roundhouse Poetry Slam and is currently working on a debut collection. Ella Frears is a poet and visual artist based in London. She’s had poems published or forthcoming in the LRB, Poetry London, Ambit, The Rialto, Poetry Daily, POEM, and the Moth among others. She’s a trustee and editor for Magma poetry magazine, was a Jerwood/Arvon mentee and was shortlisted for the Manchester Poetry Prize. She’s completed residencies for Tate Britain, Tate St.Ives, the National Trust, Royal Holloway University and K6 Gallery. Her debut pamphlet, Passivity, Electricity, Acclivity is out with Goldsmiths Press. Born in Nigeria, Inua Ellams is a poet, playwright & performer, a Complete Works poet alumni and a fellow of the Royal Society of Literature. Across his work, Identity, Displacement & Destiny are reoccurring themes in which he also tries to mix the old with the new: traditional African storytelling with contemporary poetry. His poetry is published by Flipped Eye, Akashic, Nine Arches & several plays by Oberon. Caroline Bird is a poet and playwright. She has five collections of poetry published by Carcanet. Her most recent collection, In These Days of Prohibition, was shortlisted for the 2017 TS Eliot Prize and The Ted Hughes Award. A two time winner of the Foyles Young Poets Award, her first collection Looking Through Letterboxes was published in 2002 when she was 15. She won a major Eric Gregory Award in 2002 and was shortlisted for the Geoffrey Dearmer Prize in 2001 and the Dylan Thomas Prize in 2008 and 2010. She was one of the five official poets at the 2012 London Olympics. 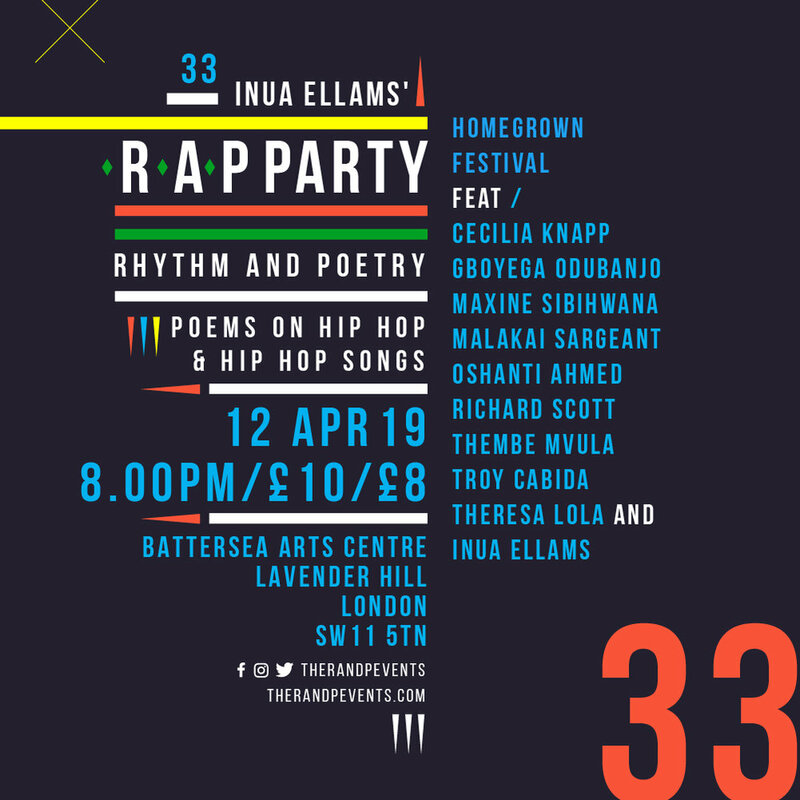 In this R.A.P Party – Rhythm And Poetry Party – a nostalgic, no-clutter, no fuss, straight up evening of hip hop inspired poems and hip hop songs, 10 poets will gather to celebrate the art form and the culture, reflecting on themes and narratives taken from cult classic movie, The Warriors following a screaming of the film; new poems and specially chosen songs. Tobi Kyeremateng is a Theatre, poetry and festival producer. She has worked with organisations such as Apples and Snakes, Bush Theatre, Roundhouse, Brainchild Festival, and more She is founder of the Black Ticket Project, increasing access to theatre for black people. Birmingham born Steven Camden (Polarbear) is one of the most respected spoken word artists in the UK. He was co-writer and script mentor on the Akram Khan Company's Olivier Award winning production DESH. He has written three novels for HarperCollins, TAPE (2013), It's About Love (2015) and Nobody Real (2018). Laurie Ogden is a poet and playwright born in Liverpool – emerging from Roundhouse’s ‘Spit The Atom’ Collective to become an unforgettable young voice in UnFOLD. Her poetry is captivating, subtle and acutely observed. Laurie work has featured on Sofar Sounds and national TV campaigns. Jeremiah ‘SugarJ’ Brown is a Black British-Jamaican writer and performer based in Croydon. He’s a Barbican Young Poet alumni and former Roundhouse resident artist. His debut show Likkle Rum with Grandma sold out at the Roundhouse as part of the Last Word festival, and at Bernie Grants Arts Centre as part of SKFEST. Hibaq Osman is a Somali writer born and based in London. Her work largely centres women, identity and the healing process with a focus on the often hidden, nuanced aspects of our experiences. Her debut poetry collection A Silence You Can Carry was published with Out-Spoken Press in 2015. She is a member of OCTAVIA poetry collective. Paul Cree is a storyteller, theatre maker, rapper and poet.. Paul’s performed at festivals and events such as The Edinburgh Fringe, Lattitude, and Bestival, as well as having his work showcased on BBC 1Xtra. He has an EP of stories entitled The 90 Sick E.P and In 2018 published his debut collection of poems and stories, entitled The Suburban with Burning Eye Books. S.K. Perry’s debut Let Me Be Like Water was published in 2018 by Melville House. She has delivered creative writing workshops for PEN International in Honduras and Scotland, for the Roundhouse in Bulgaria, and all across the UK with different schools and organisations. Bohdan Piasecki is a poet from Poland based in Birmingham. He has worked as Director of Education on the Spoken Word in Education MA course at Goldsmiths University, and was the Midlands Producer for Apples and Snakes between 2010 and 2017. He currently holds the post of General Manager at Free Radical, a Birmingham-based company creating opportunities for young artists with an activist practice. Indigo Williams is a British Nigerian poet and Spoken Word Educator from South London. She uses her poetry to explore themes of race, gender and spirituality. She has performed at TedxBrixton, BBC Radio 4’s Bespoken Word, Glastonbury Festival and has spoken at Oxford and Cambridge University. 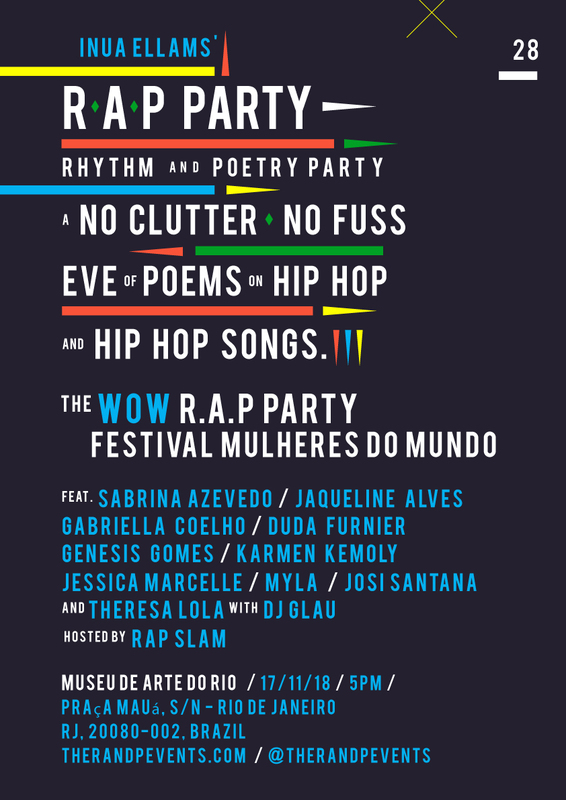 The WOW R.A.P Party, Rio, Brazil. 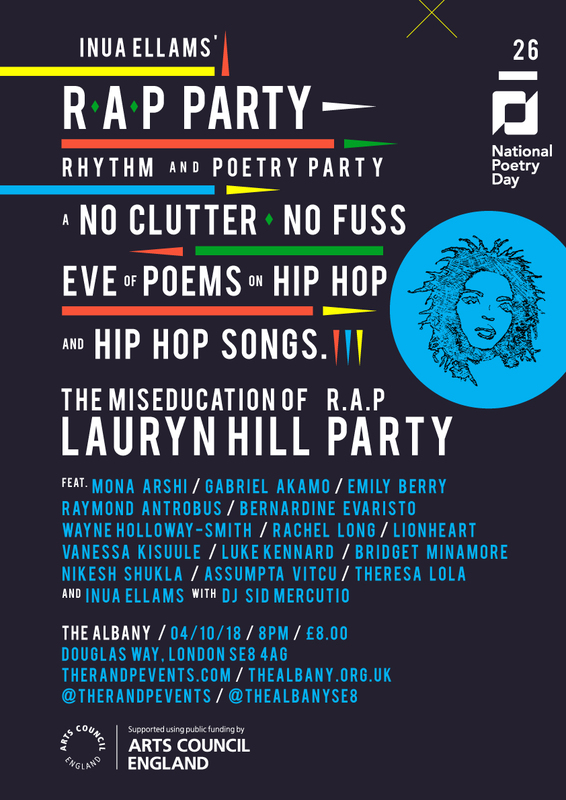 In this R.A.P Party – Rhythm And Poetry Party – a nostalgic, no-clutter, no fuss, straight up evening of hip hop inspired poems and hip hop songs, 10 poets will gather to celebrate the art form and the culture, reflecting on themes and narratives on what it means to be a woman in Brazil. Sabrina Azevedo, Jaqueline Alves, Gabriella Coelho, Duda Furnier, Genesis Gomes, Karmen Kemoly, Jessica Marcelle, Myla, Josi Santana and Theresa Lola. With DJ Glau hosted by Rap Slam. 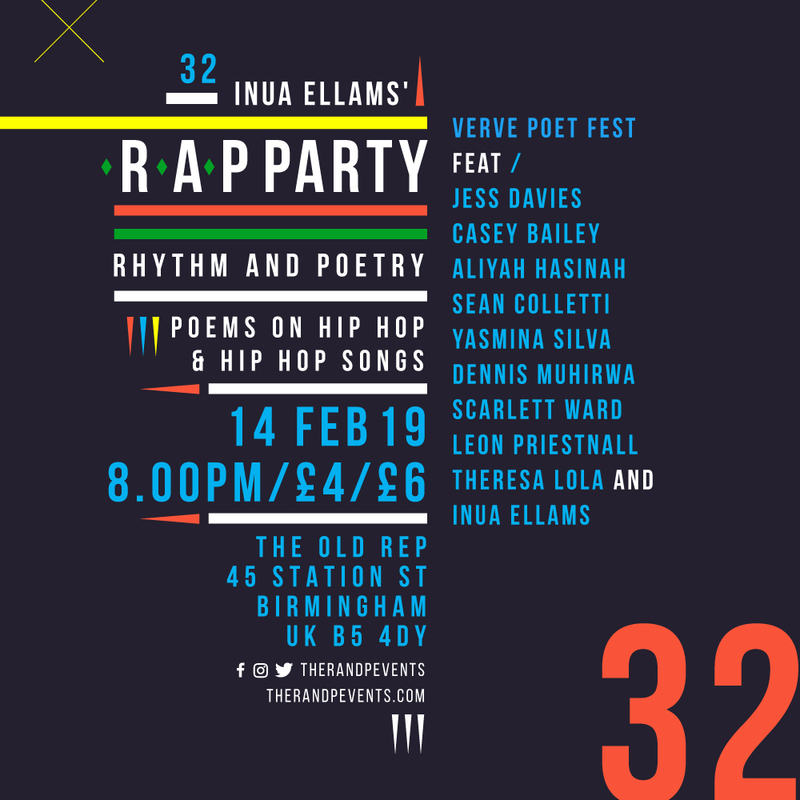 Fuel Invites you to Inua Ellams' R.A.P Party – Rhythm And Poetry Party – a nostalgic, no-clutter, no fuss, straight up evening of hip hop inspired poems and hip hop songs. 10 poets will gather to celebrate the art form and the culture, reflecting on the future with specially commissioned poems and specially chosen songs. Born in Sudan and raised in England, Asma Elbadawi is a visual artist and spoken word poet. She was chosen as one of the finalists of the Words First competition, a collaboration between BBC Radio 1Xtra and the Roundhouse. She holds an MA in Visual Arts, and pursues themes around identity and equality. Abdullah Adekola is a writer and poetry promoter based in Leeds West Yorkshire. He has performed at Brainchild Festival, The Black Verse Showcase, The West Yorkshire Playhouse, and other venues. A Black British working class poet, he offers personal reflections and social commentary on race, class, and faith. Suhaiymah Manzoor-Khan is a writer, spoken-word poet, speaker and educator invested in disrupting state narratives and power relations underpinning the violent norms of race, gender, islamophobia and coloniality. Her work has been featured in the likes of The Independent, Al-Jazeera, BBC Radio and TEDx conferences, and has been performed nationally and internationally. Matt Abbott is a poet from Wakefield. His début one-man show ‘Two Little Ducks’ is on a 22-date UK theatre tour ‪from 5 Oct-16 Nov, having received rave reviews at last year’s Edinburgh Fringe. The tour is accompanied by the release of Matt’s début collection on Verve Poetry Press. Zodwa is a playwright and poet. She was the 2014 Writer-in-Residence at the West Yorkshire Playhouse via the Channel 4 Playwrights’ Scheme. She has previously been Apprentice Poet-in-Residence at Ilkely Literature Festival (2013) and BBC Radio Leeds (2006). Andy Craven-Griffiths is a writer and performer based in Leeds. Andy has performed poetry across the UK and abroad, and had it broadcast on TV and radio (Radio 1, Radio 4, BBC 2) and published in various poetry journals. In 2018 he wrote and produced his first play, Joygernaut. He is currently studying for a PhD in creative writing. Rommi Smith is an international writer who has held numerous prestigious and historically significant writing residencies for institutions ranging from The British Council to the BBC. Smith is the inaugural British Parliamentary Writer in Residence and inaugural Poet in Residence for Keats’ House. Jamal Gerald is an artist based in Leeds. He has made work for poetry slams, films, parties and theatres. He's currently making a new show called 'Idol', which has been commissioned by Transform Festival. 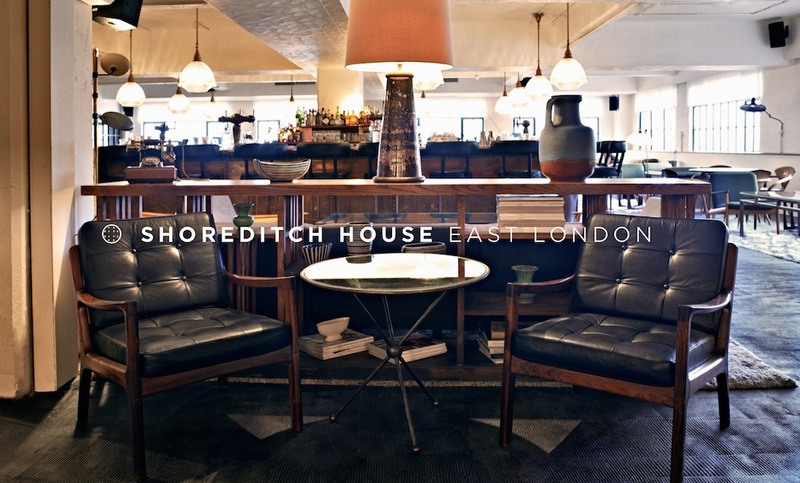 His work has been shown at the Roundhouse, Battersea Arts Centre and the Barbican. Stand-up poet Laurie Bolger has hosted venues such as The Royal Albert Hall, St Paul’s Cathedral and Southbank Centre London as well as being commissioned by BBC Radio 1, The Verb and 1Xtra. Her debut poetry collection Box Rooms was released by Burning Eye Books, showing that poetry can be your friend. Anthony Anaxagorou is an award-winning poet, fiction writer, essayist, publisher and poetry educator. His poetry and fiction have appeared on BBC Radio 4, BBC, ITV, Vice UK, Channel 4 and Sky Arts, as well as being published in The Poetry Review, and other literary journals. In 2015 his poetry and fiction writing won the Groucho Maverick Award. He has published several books, with his second full collection due out in 2019. Danielle DASH is the writer, director and producer of the multi-award winning web based drama series “Dear Jesus” and its spin-off “The Alexis Show.” “Dear Jesus” won Favourite Web Series at the Screen Nation Digital Awards in December 2015. Currently working in comedy and drama TV development, Danielle will be the UK’s Shonda Rhimes. In the meantime she writes about race, gender and popular culture on her blog DanielleDASH.com. Tyrone Lewis is the first ever Roundhouse Poet and a Roundhouse Poetry Slam Champion, Bsed in London, Tyrone is one of the co-hosts of a monthly Open Mic Night, Boomerang Club. Tyrone has also been involved with a number of major national poetry events over the years including, 2012’s Shake The Dust and 2015’s Shot From The Lip, as well as helping out with UniSlam in 2016, 2017 and 2018. Ella Frears is a poet, visual artist and curator based in south-east London. She has completed various residencies for Tate Modern, the National Trust and most recently she was Poet in Residence at Royal Holloway University writing about the Cassini Space Mission. Ella was shortlisted for the Manchester Poetry Prize 2017. Her debut pamphlet Passivity, Electricity, Acclivity is out with Goldsmiths Press. Jordan Stephens is a writer and performer best known for being one half of pop duo Rizzle Kicks. After achieving fame with Rizzle Kicks at only 19, Jordan has since gone on to create a quite contrasting sound as a third of the band, Wildhood and now goes under the alias ‘Al the Native’. His mental health campaign #IAMWHOLE reached over 120 million people online. More recently, Jordan wrote an article in The Guardian about the negative effects that Toxic Masculinity has on men’s wellbeing and has since been invited on television and at festivals to further discuss the matter. Ross Sutherland is a writer/performer, working across theatre, film and radio. In 2017, he wrote a five-part comic miniseries for Channel 4’s Random Acts, and a BBC Radio 4 documentary about British Wrestling. He is currently writing a new play, The Exorcism, opening at BAC in late October. He writes and produces the storytelling podcast, Imaginary Advice (winner: Best Fiction, 2018 British Podcast Awards). Other credits include Missing Episode (BBC2; writer/presenter) . Victoria Adukwei Bulley is a poet, writer and filmmaker. An alumna of the Barbican Young Poets, her work has featured in The Poetry Review, Ambit and tonguejournal.org, in addition to being broadcast on BBC Radio 4 Woman’s Hour, her debut pamphlet, Girl B, is part of the 2017 New-Generation African Poets series. Victoria is the director of MOTHER TONGUES, an intergenerational poetry, film and translation project supported by Arts Council England and Autograph ABP. JJ BOLA is an established writer and poet of three collections; Elevate (2012), Daughter of the Sun (2014), and WORD (2015). His debut novel, No Place to Call Home, was first published in the UK in 2017. He was one of Spread the Word's Flight Associates 2017, and a Kit de Waal Scholar for the Birkbeck, University MA in Creative Writing. JJ reads, speaks, workshops and performs all over London/the UK at various universities & festivals such as SOAS, Oxford, Kings College, Glastonbury festival, WOMAD, Cheltenham Literature festival, Africa writes and more. Salma El-Wardany isa half Eqyptian, half Irish writer, passionate about the female experience and how feminine identities are played out in today’s world. She’s currently working on her debut novel Burkas & Bikinis, and writing and performing spoken word poetry across the US and UK. Kayo Chingonyi won the Dylan Thomas prize in 2018. He is a fellow of the Complete Works programme for diversity and quality in British Poetry and the author of two pamphlets. His first full-length collection, Kumukanda, was published in June 2017 by Chatto & Windus. As well as being widely published in journals and anthologies. Sumia Jaama is a Barbican Young Poet Alumni (2017-18), she often runs workshops in secondary schools, festivals and as part of Keats house's Creative Writing Summer School. She is a linguist and programmer having completed her BA in Arabic and English literature. Sumia often writes about exploring absence and what there is to discover about blank spaces in relation to ourselves. Joshua Idehen is a poet, teacher and musician. A British born Nigerian, his poetry has been published alongside Linton Kwesi Johnson and Anthony Joseph and he has performed at festivals and respected venues across the UK and Europe. He collaborated with The Comet Is Coming on their 2016 Mercury nominated debut album 'Channel The Spirits'. He will be touring with Mobo-winning jazz band Sons of Kemet. He is working on his debut pamphlet and a one man show. Alim Kamara returned from performing at the Sierra Leone inauguration and performing at the presidents birthday dinners. He graduated with a first class degree in Creative and Media Writing, and the Edna Fuller Prize for community. He has performed in Dubai, Holland, Canada, Sierra Leone, Gambia, Peru, Argentina and the USA. Like the Griots from his past, Alim captivates his audiences and leaves them craving to learn, relate and elevate. Wana Udobang is a journalist, poet and filmmaker who works at the intersection of women’s rights, social justice, personal narratives and culture. Her work as a poet has been featured at the British Library’s Word, Symbol and Song exhibition. Her poem 'home' was published in the John Berger anthology. She has two poetry albums. The first titled Dirty Laundry and her current sophomore album In memory of forgetting. The themes in her poetry explore trauma, feminism, familial relationships, love and self-renewal. Wana has performed in festivals across Nigeria and the African continent. Theresa Lola is a British Nigerian Poet. She was one of the winners of the 2018 Brunel International African Poetry Prize. She was shortlisted for the 2017 Bridport Poetry Prize. She is an alumni of the Barbican Young Poets programme. Jasmine Cooray is a poet, facilitator and counsellor from London, of Sri Lankan and mixed European lineage who started out writing angsty poems in her bedroom in purple ink. Now her poems are less angsty and she teaches others to use creative tools to access their internal worlds. Her abstract accolades include: Writer in Residence at the National University of Singapore in 2013, a 2015 BBC Performing Arts Fellow, and now a Spread the Word Associate Writer. To balance her reclusiveness, she does an excellent line in hugs. Tim Clare is a performance poet based in the UK. He heads up Homework, a regular poetry night in Bethnal Green and has an MA in Creative Writing from the University of East Anglia. As a stand-up poet, Tim has performed nationwide including at the Edinburgh Fringe and countless festivals. The Honours is Clare’s debut novel, set in Norfolk in 1935 as war looms over Great Britain. Kat Francois - Kat Francois is a performance artist, poet, actor and playwright. A youth and adult workshop facilitator. Kat was the first person to win a televised poetry slam in the UK, on BBC3 in 2004, and a year later went on to win the World Slam Poetry Championships in Rotterdam. Yomi Ṣode balances the fine line between Nigerian and British cultures, which can be humorous, loving, self-reflective and, at times, uncomfortable. Over the past nine years, Yomi has had work commissioned by The Mayor’s Office, BBC World Service/ BBC Africa, Channel4, various charities and recently presented a poem at the UN Humanitarian Summit. Jolade Olusanya is a poet, director and filmmaker based in East London. He is part of SXWKS, a creative collective and a Barbican Young Poet. He was the Outspoken Prize for Poetry and Performance Poetry Winner of 2017 and a finalist in the 1st ever Young Poet Laureate for London post in 2013. He is currently working on his debut poetry collection, poetry films and a variety of other creative projects. Hannah Lowe is a poet and researcher. Her first poetry collection Chick (Bloodaxe, 2013) won the Michael Murphy Memorial Award for Best First Collection. She has also published three chapbooks: The Hitcher (Rialto 2012); R x (sine wave peak) 2013); and Ormonde (Hercules Editions 2014) and a family memoir Long Time No See (Periscope, 2015). She teaches Creative Writing at Brunel University and is the current poet in residence at Keats House. Roger Robinson released an album with Disrupt on every reggae lovers favourite label Jahtari in 2015 and is a founding member of King Midas Sound. He has performed worldwide and is an experienced workshop leader and lecturer on poetry. He was chosen by Decibel as one of 50 writers who have influenced the black-British writing canon. He received commissions from The National Trust, London Open House, The V&A and Theatre Royal Stratford East where he also was Associate Artist. Jack Underwood is a poet, who also writes short fiction and non-fiction. A recipient of the Eric Gregory Award in 2007, he published his debut pamphlet in 2009 as part of the Faber New Poets series. His first collection Happiness was published by Faber in 2015 and was winner of the 2016 Somerset Maugham prize. He is a lecturer in creative writing at Goldsmiths College and is currently writing a non-fiction book about poetry and uncertainty. Two pamphlets, Solo for Mascha Voice and Tenuous Rooms will be published by Test Centre in 2018. Antosh Wojcik is a poet, performer and Lecturer of Poetry and Creative Writing at University of Winchester. He is one half of Post Everything, a sound art duo. Penned in the Margins is producing his cross-arts drumming and poetry show about memory, ‘How To Keep Time: A Drum Solo for Dementia’. Theresa Lola is a British Nigerian Poet, she was shortlisted for the 2017 Bridport Poetry Prize and 2016 London Magazine Poetry Prize. She won the 2017 Hammer and Tongue Slam. She is a Barbican Young Poet Alumni and part of Octavia Women of Colour Collective led by Rachel Long. She is the editor of FourHubs Magazine, a lifestyle magazine for writers. 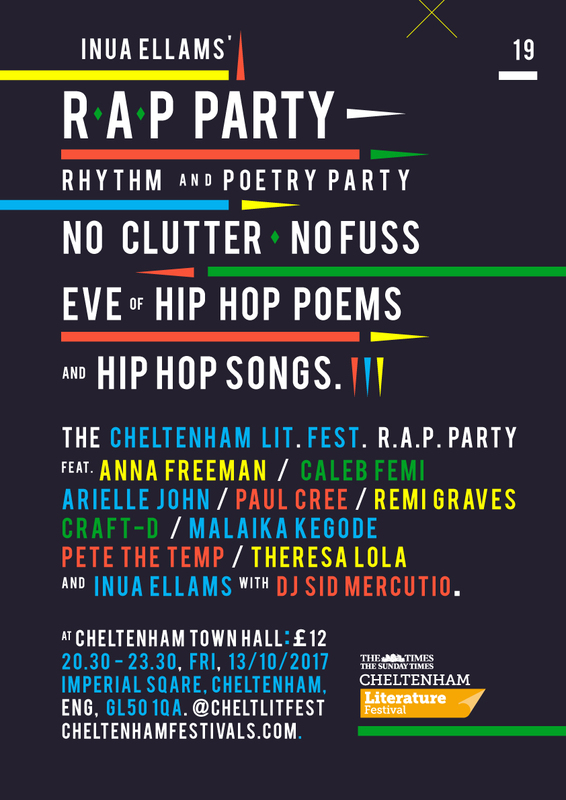 She curates the event RAP Party with Inua Ellams. 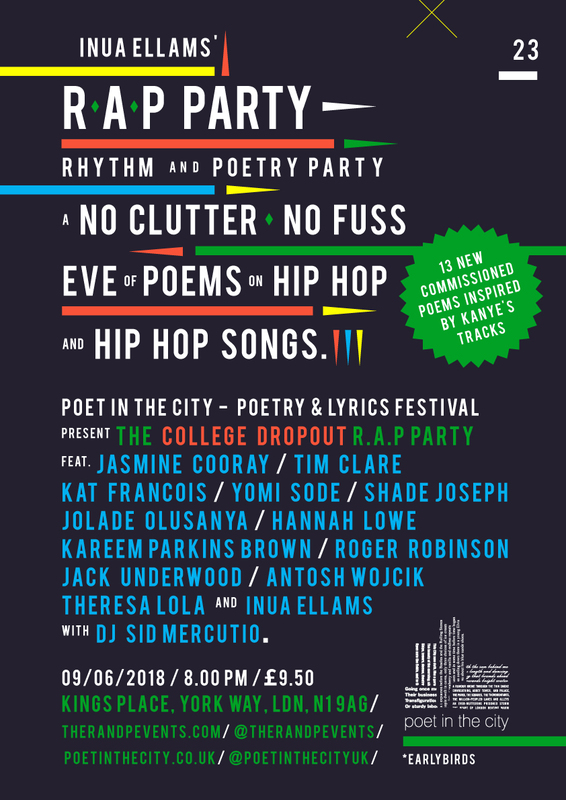 This special event commemorates 2015's ground-breaking anthology, The BreakBeat Poets — 'New American Poetry in the Age of Hip-Hop' and will feature editor, Kevin Coval alongside Safia Elhilo. 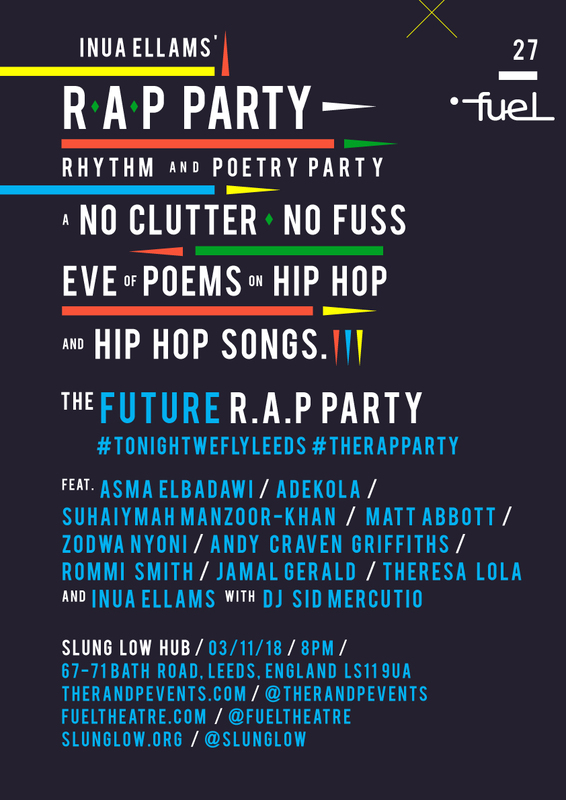 Also on the night, representing British Hip-Hop poetics: Caleb Femi, Seraphima Kennedy, Nick Makoha, Momtaza Mehri, Anis Mojgani, Raheela Suleman, Emmanuel Sugo, Theresa Lola and Inua Ellams, with Dj Sid Mercutio. Kevin Coval is the author of 10 books, including A People’s History of Chicago, editor of The BreakBeat Poets: New American Poetry in the Age of Hip-Hop.. Additionally, he is the Artistic Director of Young Chicago Authors — winner of a MacArthur Award for Creative and Effective Institutions in 2016. His work has appeared on The Daily Show, HBO’s Def Poetry Jam, Poetry Magazine, and more. 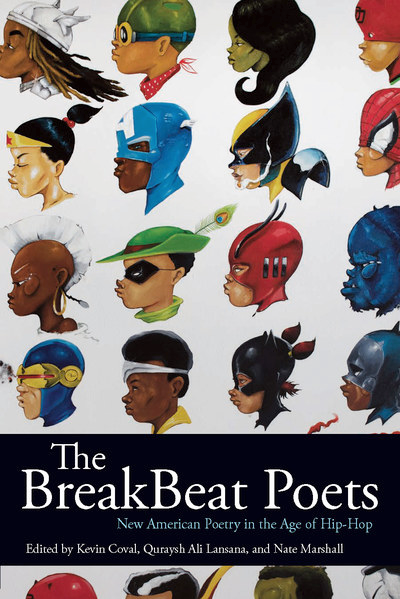 He is the editor of the Haymarket Books imprint BreakBeat Publishing,, and teaches hip-hop poetics in high schools, colleges, and community centers around the globe. Safia Elhillo is the author of The January Children (University of Nebraska Press, 2017). Sudanese by way of Washington. Safia is a Pushcart Prize nominee, and recipient of the 2015 Brunel University African Poetry Prize and the 2016 Sillerman First Book Prize for African Poets. Safia’s work has appeared or is forthcoming in POETRY Magazine, Callaloo and in anthologies including The BreakBeat Poets: New American Poetry in the Age of Hip-Hop and Women of Resistance: Poems for a New Feminism. Her work has been translated into Arabic. Seraphima Kennedy grew up in west London. She writes poetry and creative non-fiction about family, migration, conflict and music. Seraphima is a Jerwood/Arvon mentee in poetry where she has been working with Pascale Petit. Last year she was shortlisted for The White Review Poets’ Prize, and performed at Ledbury Poetry Festival and Poetry in Aldeburgh Festival. She's a proud member of the collective Malika’s Poetry Kitchen. Nick Makoha debut collection Kingdom of Gravity is shortlisted for the 2017 Felix Dennis Prize for Best First Collection and nominated by The Guardian as one of the best books of 2017. He won the 2015 Brunel International Poetry prize and the 2016 Toi Derricotte & Cornelius Eady Chapbook Prize for his pamphlet Resurrection. A Goldsmiths, Cave Canem & Complete Works Alumni. His poems appeared in The New York Times, Poetry Review, Rialto, and Wasafiri. Anis Mojgani is a two time US National Poetry Slam Individual Champion and winner of the Worldcup Poetry Slam. The author of five books, Anis’ work has appeared on HBO, NPR, and in journals Rattle, Forklift Ohio, and Bat City Review, amongst others, and has performed for varied audiences all over the globe. Originally from New Orleans, he lives in the States, currently in Portland OR. Raheela Suleman is a film student, writes poetry, screenplays and makes films and beats. She was born in London, but is open to being buried elsewhere. She is also a Barbican Young Poet programme alumni and a part of Octavia Women of Colour collective resident at the Southbank Centre. Emmanuel Sugo is a singer, writer, musician and theatre practitioner whose poetry is centred around the function of imagination in self discovery. He has produced several plays and recently worked with Poets Platform on a scratch titled Beanstalk exploring the effect fear and dreams on identity. He is a word4word slam champion and hosts a poetry slam called Spout every 2nd Tuesday of every month.. He was also one of the finalist for the BBC uk slam competition. Featuring: Kat Francois, Lewis Buxton, Antonia King, Will Harris, Fran Lock, Joshua Judson, Eleanor Penny, Marvin Thompson, Theresa Lola and Inua Ellams. Lewis Buxton - Lewis Buxton is a poet and arts producer, he leads creative writing workshops in school and libraries around the country. In 2016 he founded TOAST, an arts project dedicated to the professional development of poets in the U.K. He is currently working on his first pamphlet about sport, masculinity & boyhood. Antonia King is a mystery to all. Will Harris - Will Harris is an Assistant Editor at The Rialto. He has published a pamphlet of poems, All this is Implied. Mixed-Race Superman, an essay on Barack Obama, Keanu Reeves and the meaning of heroism, will be published by Peninsula Press in May. His work also features in the Bloodaxe anthology Ten: Poets of the New Generation. Fran Lock - Fran Lock is the author of three poetry collections, Dogtooth (Out- Spoken Press, 2017), The Mystic and the Pig Thief (Salt Publishing, 2014), and Flatrock (Little Episodes Publishing, 2011). She won the 2015 Outspoken Poetry Prize. Joshua Judson - Joshua Judson is a poet, facilitator and editor. He is an alumnus of the Mouthy Poets program at Nottingham Playhouse, and is part of the Barbican Young Poets community. His work has appeared in The North and Magma. He is a student at Guildhall School of Drama in London, where he is in his final year studying Performance & Creative Enterprise. Eleanor Penny - Eleanor Penny is an alumnus of the Barbican Young Poets programme. She produces and hosts poetry podcast Bedtime Stories for the End of the World, supported by Spread the Word and the Arts Council England. Her first pamphlet is due out in mid-2018, published by flipped eye. Marvin Thompson - Marvin Thompson lives in mountainous south Wales. In 2016, he was one of three poets selected for the Primers 2 mentoring scheme run by The Poetry School and Nine Arches Press. In 2017, he won third place in Ambit Magazine’s international poetry competition. Theresa Lola - Theresa Lola is a British Nigerian Poet, she was shortlisted for the 2017 Bridport Poetry Prize. In 2017 she won the Hammer and Tongue National Poetry Slam. She is part of SXWKS and Octavia Women of Color collective. She runs RAP Party with Inua Ellams. Inua Ellams - Inua Ellams is an internationally touring poet, playwright, performer, graphic artist & designer. He was recently awarded the Liberty Human Rights Award for his one-man show, 'An Evening with an Immigrant' in 2017. The Art of Rap Official Trailer, with interviews from: Ice-T. Cast: Afrika Bambaataa, Big Daddy Kane, B-Real, Bun B, Chino XL, Common, DJ Premier, DMC, Doug E.
This special event is in two parts. Part one will be a screening of Ice Cube's critically acclaimed documentary film: The Art of Rap. You can read more about it here. 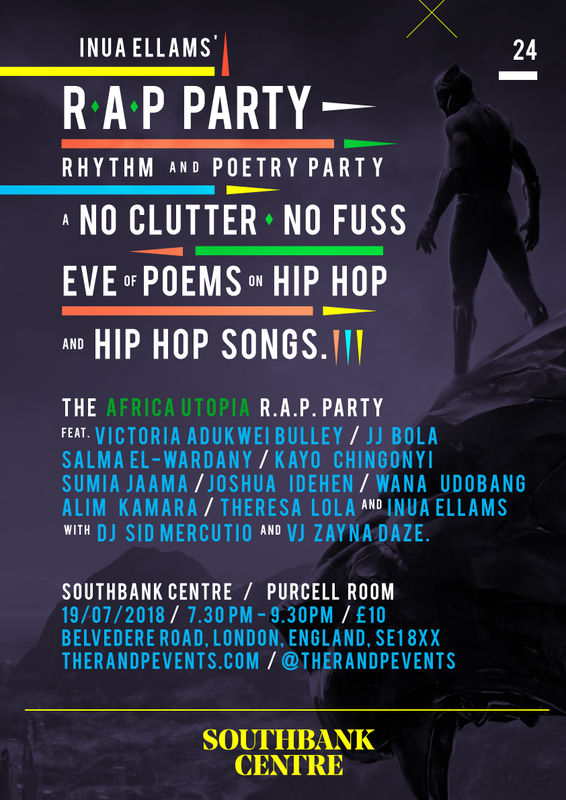 Part two, will be the R.A.P Party itself, featuring Jay Bernard, Gabriel Akamo, Amina Jama, JJ Bola, LyricL, Joshua Idehen, Tania Nwachukwu, Kieron Rennie, Michelle Tiwo and Inua Ellams, with DJ Sid Mercutio. Featuring: Kayo Chingonyi, Malika Booker, Kei Miller, Fatima Kelleher, Jolade Olusanya, Rachel Long, Roger Robinson, Amaal Said, Yomi Sode, Theresa Lola and Terrance Hayes, with Dj Sid Mercutio. Featuring: Victoria Adukwei Bulley, Caleb Femi, Dzifa Benson, Charles Obiri-Yeboah, Theresa Lola, Inua Ellams, with Dj Sid Mercutio. Featuring: Hazel Hogan, John Cummings, Niamh O Beirne, Colm Thomas Keegan, Felicia Olusanya, Karl Parkinson, Raven, Stephen James Smith, Theresa Lola, Inua Ellams, with Dj Sid Mercutio. Featuring: Maria Ferguson, Anthony Anaxagorou, Bridget Minamore, Omar Bynon, Ruth Sutoyé, Lionheart, Belinda Zhawi, Emmanuel Sugo, Theresa Lola, Inua Ellams, with Dj Sid Mercutio. Featuring: Arinze Kene, Shade Joseph, Jacob Sam-La Rose, Seraphima Kennedy, Will Harris, Rachel Long, Theresa Lola, Inua Ellams, with Dj Sid Mercutio. Featuring: MR GEE, Laurie Bolger, Jolade Olusanya, Sahrah Sheikh, Chris Redmond, Paula Varjack, Antosh Wojcik, Theresa Lola, Inua Ellams, with Dj Sid Mercutio. With: Victoriana Bulley, Zia Ahmed, Maddie Godfrey, Joshua Idehen, Momtaza Mehri, Adam Kammerling, Joelle Taylor, Christian G Smith, Theresa Lola and Inua Ellams. With: Hibaq Osman, Charlotte Josephine, Vanessa Kisuule, Josette Joseph, Theresa Lola, Kareem P Brown, James Massiah, Lewis Buxton, Cameron Holleran and Inua Ellams. With: Amy Acre, R.A. Villanueva, Rosie Knight, Toni Stuart, Yomi Greeds Sode and Inua Ellams. With: Anaxagorou, Patience Agbabi, Tim Clare, Salena Godden, Dan Cockrill, Sabrina Mahfouz, Keith Jarrett, Deborah Stevenson, Bohdan Piasecki, Belinda Zhawi & Inua Ellams. DJ Khalil, VJ, Dan Fenton.Warsan Shire, Kat Francois, Hollie McNish, Bridgette Minamore, Kristiana Rae Colon, Deanna Rodger, Aja Monet, Talia Randall, Lyric L, Kieran Yates, Vjay: Zainab Adamu, Djay: Marsha Smith.